Former vice president and current environmental evangelist Al Gore is not happy with President Obama. In a blog post yesterday Gore criticized Obama for telling the EPA to withdraw a proposal to tighten government smog regulations, citing the need to reduce regulatory burdens and uncertainty for businesses during a time of economic uncertainty. Gore’s post accused the President of bowing to polluters and said that it would result in higher medical bills for seniors with lung disease and more children developing asthma, though he didn’t back up his charges with any scientific proof. Gore also praised the protesters who demonstrated in front of the White House last Friday against a proposed tar sands pipeline that he said would bring a massive increase in global warming pollution. On Friday afternoon, as brave and committed activists continued their non-violent civil disobedience outside the White House in protest of the tar sands pipeline that would lead to a massive increase in global warming pollution, President Obama ordered the EPA to abandon its pursuit of new curbs on emissions that worsens disease-causing smog in US cities. Earlier this year, the EPA’s administrator, Lisa Jackson, wrote that the levels of pollution now permitted — put in place by the Bush-Cheney administration– are “not legally defensible.” Those very same rules have now been embraced by the Obama White House. 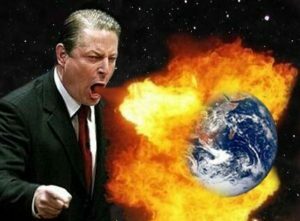 As ABC News noted, Gore has been largely absent from the world stage lately but apparently this environmental betrayal by Obama was just too much for Big Al.